Description: The 54-year old Avenue Plaza was undergoing a major renovation and plumbing issues required immediate attention. The plumbing system was experiencing low water flow, variable temperature and variable pressure throughout the hot water system. After a thorough inspection of the copper/galvanize plumbing system, TDT Plumbing identified heavy calcium buildup throughout the entire hot water system as the cause. TDT Plumbing identified the problem and provided a non- intrusive, fast and reliable solution — the ACE DuraFlo® System of pipe restoration. 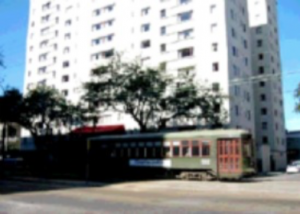 The Avenue Plaza is an elegant, 12-story hotel in New Orleans’ picturesque Garden District on the historic St. Charles Avenue Streetcar Line. The 54-year old hotel was undergoing a major renovation and plumbing issues required immediate attention. The plumbing system was experiencing low water flow, variable temperature and variable pressure throughout the hot water system. 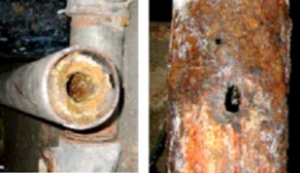 After a thorough inspection of the copper/galvanize plumbing system, TDT Plumbing identified heavy calcium buildup throughout the entire hot water system as the cause. The calcium buildup was extreme with some lines 100% blocked. To complicate the problem, the hotel was built with asbestos and abatement was not economically feasible. The challenge was to clear the copper/galvanize risers without undertaking asbestos abatement and keeping the property able to continue business. TDT Plumbing identified the problem and offered a non- intrusive, fast and reliable solution — the ACE DuraFlo® System of pipe restoration. TDT Plumbing restored 28 hot water risers and branch lines, from the re- circulation loop to the main hot water supply line on the 12th floor. The restoration work of the piping system required no cutting of walls, ceilings or bathroom areas. Asbestos abatement was minimized as the pipes were accessed without having to expose the lines existing in the walls. Because of TDT Plumbing and the ACE DuraFlo® System, the Avenue Plaza Hotel saved both money and time. They couldn’t be more satisfied.